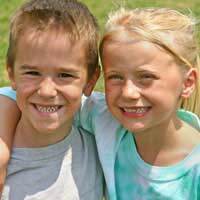 Making friends and forming relationships are integral parts of a child’s social and emotional development. When your child is able to walk and talk usually starting around 18 months of age, (s)he will probably show a natural inclination to be around children his/her own age and join in group activities. Some children use these opportunities to explore the children around them and make friends, but some remain a bit of a loner. For parents, understanding their child’s interactions with others can be a key to helping their children make friends. Sometimes parents worry that their young children are antisocial because they tend to poke, pull, hit, kick or bite other children when they are first introduced. While these acts are not necessarily enjoyable, they are usually fairly normal. For young children, other youngsters are a curiosity to explore. Young children are still putting together their own worldviews so what may seem like antisocial behaviour to adults is very often a child’s way of researching these new little people that are surrounding him/her. Reminding your child gently that his/her behaviour hurts the other child will help him/her to understand that other children are the same as (s)he is and that the golden rule is really very logical – (s)he should treat others as (s)he would like to be treated. Taking your child to kid rich venues such as the local park, classes at the local community or play groups established by neighbourhood families. Inviting children over for a play date so that your child can remain in the emotional comfort of his/her own home. Keeping play dates small so that your child can devote all of his/her attention to one other child and one activity. Encouraging cooperative play so that your child must interact with other children. Consulting a teacher, counsellor or your GP if you truly have fears about your child’s inability to make friends. Making friends is a natural process, though some young children need a little nudge in the right direction. There is much parents can do to help their child interact well with others and make friends. If, even after a parent’s best efforts, a child still prefers to spend time alone then parents should consult a childcare expert, teacher, counsellor or GP for information pertinent to their specific situation.